Winter market The Langley Community Farmers Market is 10 a.m. to 2 p.m. at the Kwantlen Polytechnic University Langley campus, 20901 Langley bypass. Dates: April 14. Shot in the Dark Langley Film Nights show movies from around the world. All shows start at 7:30 p.m. at Cineplex Langley (Colossus Theatre). $10 per ticket or $60 for a seven-film pass. At the door in or in advance at Wendel’s Bookstore and Cafe. April 18: Film Stars Don’t Die in Liverpool, based on the relationship between Peter Turner and actress Gloria Grahame. Income tax clinic The Langley Seniors Resource Centre clinic is by appointment (30 minutes). Bookings available. Seniors must meet eligibility requirements to receive help filling out their taxes. Info and booking: in person at the centre, 20605 51B Avenue or 604-530-3020. Seniors LGBTQ2 group The social group meets noon to 2 p.m. at the Timms Community Centre. Members decide group focus/activities. All sexual orientations welcome. Dates: April 23, May 28. Info: seniorsoflangley@gmail.com. Coalesce The new TWU School of the Arts, Media + Culture has a senior student exhibit at the campus gallery (in the Atwater Library) until April 29. Opening reception is 7 p.m. on March 29. Info: twu.ca. Bond to Literacy Free 12-week family literacy program to help people read to their children (ages three, four and five). Thursdays April 5 to June 21, at 5:30 to 8 p.m. at Aldergrove Family Place, 27330 28th Ave. Childminding and books provided. Registration and info: 604-817-0265. Langley Field Naturalists Walk the trails of a former gravel pit and dump, Jackman Pit Park, 272nd Street and 10th Avenue. 9 a.m. on April 6. Guided by Bob Puls. RSVP and info: 604-856-7534. Comedy night All ages comedy evening starts at 7 p.m. at the Bez Arts Hub, 20230 64th Ave., on April 6. Tickets: $10 advance, $12 at the door. Info: bezartshub.com. 24-Hour Theatre Admission is $3 to view the works in the annual Trinity Western University theatre competition. Playwrights have fewer than 12 hours to write a piece that is presented 24 hours after they began. At 7:30 p.m. on April 7 at the campus. Info: theatre@twu.ca. Easter dance The Guys ’N’ Gals Square Dance Club invites the public to Tyler’s Cotton Tail Dance April 7 at the Aldergrove OAP Hall, 3015 273rd St. Doors open at 5 p.m., potluck at 6 p.m., and dancing at 7:30 p.m. Square and social dance, spot dances. $8 per person. Tickets: Darlene, 604-358-2841. Potluck dish: Pauline, 604-722-2874. Waisted Efforts Clothing historian Ivan Sayers presents a fashion show of clothing from 1900 to 2000. At 2 p.m. on April 7 in St. George’s Anglican Church, 9160 Church St., Fort Langley. Tickets: $20. At Country Lane Antiques or Wendel’s Bookshop and Cafe. Wildflowers and wetlands Metro Vancouver has a guided walk of West Creek Wetlands 1 to 3:30 p.m. on April 8. Free. Ages 13 and older. Must RSVP in advance: 604-432-6359 or programs.info@metrovancouver.org. Crime prevention meeting Free public session from 6 to 9 p.m. on April 9 in the Fort Langley Community Hall. Topics: crime prevention, RCMP programs, how to organize a Neighbourhood Watch, and Q&A. Hosted by the Fort Langley Community Association. Blackberry busters Join the Glen Valley Watersheds Society for invasive plant pulling 10 a.m. to noon on April 11 and April 25 at the West Creek Wetlands. Register at stewardship@leps.bc.ca. Equipment and refreshments provided. Power of the Purse Soroptimsts of the Langleys invite the public to the fundraiser at Newlands Golf Course starting at 6 p.m. on April 12. Pick up purses and jewelry. Special purses auctioned. Proceeds support Ishtar Transition Housing Society violence prevention program for schools. Live Your Dream awards presented. Tickets: $30. At Eventbrite or Carol, 604-535-3820. 90th annual Bradner Flower Show 10 a.m. to 5 p.m. on April 13, 14 and 15 at the Bradner Community Hall and Bradner Elementary, 5305 Bradner Rd. Hundreds of daffodil varieties and other plants as well as tea room, home baking, plant sale, crafts, music, wineries, craft beer tastings, seminars, and speakers. Bradner handbell concert at 1 p.m. Brian Minter 2 p.m. on April 13. $2 admission. Cut flower sales funds go to Abbotsford Memorial Hospital. Info. bradnerhall.ca or Facebook. • Tax clinics Help to fill out returns is offered to those with low incomes. Available mid-March to the end of April. Learn if you qualify by contacting the branch – Aldergrove or Muriel Arnason. Offered through ISS of BC, 604-510-5136. • Art Critiques the last Monday of each month. Are you developing your talent as an artist? Bring a piece of art to be discussed and interpreted by fellow participants, as well as by an experienced art facilitator. Pre-registration required. Call ahead to confirm. 7 p.m. Hosted by Amy Dyck. April 30, May 28, June 25. • Income tax clinics Offered in partnership with the Immigrant Services Society of B.C., clinics are offered between 10 a.m. and 2 p.m. on Thursdays and Saturdays until April 28. Must book appointment in advance. Contact library staff to determine eligibility. • Opens for the season April 1. • Walking tours Travel the perimeter of the main Mavis Family Farm and learn about local history, street names and more. Noon, April 14 and 15, May 5 and 6, 26 and 27, and June 16 and 17. • Walking tours The Fort Langley church tours include a fur trade wedding and a tour of three churches. Noon, April 21 and 22, May 12 and 13, and June 2, 3, 23 and 24. • Walking tours Hudson’s Bay Company Farm tour by costumed guide is noon, April 7, 8, 28 and 29, May 19 and 20, and June 9, 10 and 30. • Fox & Hounds Pub, 264 32nd Ave.: 1st and 3rd Monday of the month. RSVP: 604-533-1679. $7. Hominum The Hominum Fraser Valley chapter is a support and discussion group to help gay, bi- or questioning men. It meets the last Monday of each month. Info: Don, 604-329-9760, or Art, 604-462-9813. Osteoporosis Canada The Langley branch meets on the second Monday of the month 1 to 2:30 p.m. in the Langley Seniors’ Resource Centre, 20605 51B Ave. Everyone welcome. Info: kbrett@vancouverinternet.com. No meetings June, July and August. April 9: Talk on dementia and help with osteoporosis concerns. 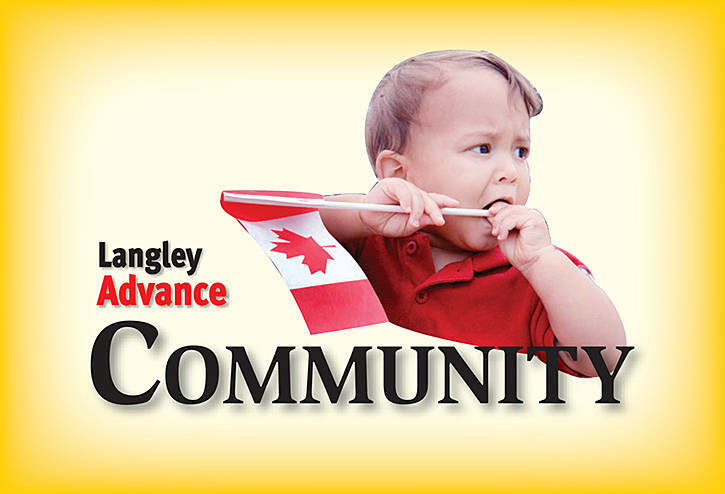 Langley Newcomers and Friends The non-profit, community-minded group for women of all ages meets at the Southwinds Estates Clubhouse, 21164 88th Ave., on the first Tuesday of the month. Info: Karen, 604-992-8741 or langleynewcomers@hotmail.com. New members welcome.